Most of the day was spent in Norwich shopping, however, there was time view some of the City's bus activities around midday. Not many unusual sightings, although there was a sign that summer is on its way with the McMaster Awaydays Leyland Olympian open topper G520VBB out on City Sightseeing duties. She started her life with Kentish Bus in 1990, then moved to Arriva London followed by a transfer to Norwich in 2008 for the City Sightseeing service. She is pictured here at Castle Meadow. Earlier, Sanders Mercedees Vario 703 YN09LME was on a contract working picking up passengers outside Castle Mall on Castle Meadow. Two Norfolk Greens were seen on inward journeys along Castle Meadow; Tempo 106 YN58FXH and Solo 618 MX54WMJ. The latter had blue livery below the windows. East Norfolk Bus has now improved on the many ways you can contact or receive information from me. The latest development is that East Norfolk Bus is now on Twitter - you can now tweet me @EastNorfolkBus. The Twitter account was only established yesterday morning and I already have three followers. One of them is Andy and I would like to thank him for his warm welcome to Twitter land! However you can still leave any comments on this blog or via email at eastnorfolkbus@yahoo.com. Any comments or pictures for the blog are very useful/welcome and their use will be acknowledged. Finally you will also notice a direct feed to my Flickr site where you can see all my pictures from last year and this year too. Today's Great Yarmouth edition of The Advertiser has details of a forthcoming auction by local agent Aldreds at Great Yarmouth Racecourse on the 12th May. One of the properties included is the former Caroline Seagull coach depot at Mill Lane in the town. The depot comprises a 0.5 acre secured freehold site and is being advertised as having development potential subject to planning approval. It has a guide price of £100,000. With the traditional weekend fair due after the Easter break, the majority of the town's Beach Coach Station was taken over by vehicles and caravans owned by the attractions as a temporary store/camp site. This afternoon, Shearings' Setra 216 BF10VCJ was present and is pictured above. I was a little disappointed as I was hoping to photograph one of their new '11' registered Setras I saw travelling northbound on Southtown Road late yesterday afternoon. I made a couple of visits to the town's Beach Coach Station over the Easter Weekend. Early Saturday afternoon saw around half a dozen independents on site; whilst on Easter Monday afternoon nine vehicles were noted. Amongst those seen there today were local operator Neaves of Catfield's Van Hool A16PSN (see left). Beach Coach Station was unusually busy for a Tuesday with no less than 15 coaches on site. They included two vehicles from Nottingham City Coaches (YN07DZW and YN58CGP) (see above) and one each from National Holidays (57 NH05CDH) and Shearings (212 BF10VCC). Normally only one or two coaches can seen there on a Tuesday - if you are lucky!. 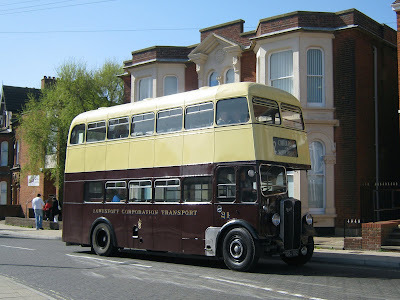 A second Nottingham City Coach was noted in Great Yarmouth today; the second in as many weeks. Today's vehicle was a Plaxton bodied Volvo B12B, registration YV58CGF. She was delivered new in September 2008 to Moseley of Loughborough and is pictured earlier today at the town's Beach Coach Station. The Eastern Daily Press reports that Norfolk Green is taking over all of King’s Lynn’s town bus routes after funding cutbacks result in First East England Buses surrendering its services. Click here to see the full article. Drivers currently working for First will transfer to Norfolk Green and the X1 service which runs from Lowestoft to Peterborough, via Great Yarmouth, Norwich and Kings Lynn, will continue to be run by First. Whilst the X1 is expected to be largely unaffected by the Kings Lynn decision, a revised service is expected to commence at the same time as the transfer of services take place. It is understood that the X1 is to be split with the service operating every 30 minutes between Kings Lynn and Peterborough with a reduction in frequency to an hourly service between Kings Lynn and Norwich. However, this will be supplemented by a Lowestoft to Dereham (via Great Yarmouth) service providing a 30 minute service between Dereham and Norwich. The photograph above shows First's Gemini 37570 AU58ECT negotiating the turn at King Street in Great Yarmouth with the 13.55 Lowestoft to Peterborough X1 on 14th March 2011. Diss operator Simonds had a presence at the Beach Coach Station in Great Yarmouth this afternoon in the shape of an Van Hool bodied Volvo B12M. New Anglianbus vehicles are now being seen in regular service in the Great Yarmouth area. This is Scania Omnilink YT11LVF on the 13.50 Great Yarmouth to Kessingland 601 service earlier today She has fleet number 435 and joins sister vehicle YT11LVE. The Beccles-based operator has a further six vehicles on order this year including three more Scania Omnilinks and three Optare Versas - all scheduled for delivery before the summer of this year. Two National Holidays' vehicles were at the town's Beach Coach Station earlier this afternoon. They were (left to right) 63 (YJ03VML) and 21 (NH09HRH). The former is a TransBus Paragon bodied Volvo B12M which provides a contrast with the Setra S416GT-HD. No 63 was seen later in the afternoon picking up its passengers at Market Gates prior to its return to Pontins. Yesterday's Great Yarmouth Mercury reported that the town's Beach Coach Station is one of the first locations being considered by the newly formed Norfolk Development Company to advance development projects across the county. Plans are being drawn up for a major housing scheme on the North Denes Road site and it is understood that alternative sites for coach and lorry parking are already being considered. Spent some time watching the comings and goings at Lowestoft bus station this afternoon with the usual appearances of First Eastern Counties and Anglianbus vehicles plus the odd Nightingale minibus. I was, therefore, somewhat surprised to see Lowestoft Corporation 21 GBJ192 rumble by! Built in 1947, she is an AEC Regent II with Eastern Coachworks body and is preserved at the nearby East Anglian Transport Museum at Carlton Colville. Number 21 was providing a free bus service to the museum's Tar, Sweat and Steam Launch Event from Lowestoft Bus and Railway Stations. A Shearings Volvo B12M was sighted earlier this afternoon on North Drive in Great Yarmouth in the gloriously warm sunshine. I managed to get across the road before she passed me, allowing me to get a good photo of her. She was in Grand Tourer livery with registration MX05AHF and fleetnumber 714. A rare visitor to the town this afternoon was Nottingham City Coaches Volvo B12M FP02YDK. Introduced by the East Midlands operator in May 2002 it has Plaxton bodywork and fleetnumber 793. The 53 seater is pictured at Market Gates. Earlier in the day new Anglianbus YT11LVE was noted on the 13.50 Great Yarmouth to Kessingland in Gorleston High Street. It sports fleetnumber 435. This afternoon, in a chilly Gorleston High Street, I was fortunate in photographing the three remaining Caister Road allocation of Presidents. They were (from top to bottom) 32101 (LT02ZCK), 32203 (LT52WTJ) and 32205 (LT52WTL). Others in the Great Yarmouth allocation can be viewed on my Flickr site or through earlier postings on this blog. Finally, an Anglianbus Tempo was recorded exiting the James Paget Hospital at around 17:50 this evening. Registered LT11LVE, it was seen departing on the 601 service to Great Yarmouth having originated from Southwold. Unfortunately I was unable to note the fleet number as I was driving at the time! Friday afternoon saw me out on one of my walks around the town centre and sea front - as I have heard many times before 'exercise is good for you'! Walking along the sea front I was passed by Smiths Coaches L18SLT (below) on North Drive. She was on her way to the Marina Centre to pick up schoolchildren who had just completed their swim. After walking to the Wellington Pier, I then returned to the Town Centre and wandered around the Market Gates bus station in the hope of seeing more First Eastern Counties Presidents operating on service 8 between Caister Second Avenue and Gorleston's James Paget Hospital. I was rewarded with No 33200 LT52WTE arriving in the murk of the bus station; but I decided to get a better picture outside BHS on Regent Road. A few moments later 33200 LT52WTE moved out of the bus station and I photographed her. All in all a good afternoon's exercise and very rewarding picturewise too. Five vehicles from five different operators in around two hours of walking! This week's Great Yarmouth Mercury has a few bus related items of interest. Firstly, the introduction of the new timetables from Sunday 28th March has already provoked comment. An article on page two relates the story of a lady from California (near Scratby - not the US one!) not being able to get home from work in the evening as there are no buses to Scratby between 18.45 and 22.45. She finishes work at 20.00. She either faces a long walk, a taxi or a change in her working hours. For the full article please click here. Another lady has written to the paper about the removal of the No 2 Sunday service provided by First Eastern Counties. She points out that there a 'lot of older people...who rely on the service' and cannot walk too far. Thirdly there is an article on the collapse of Lowestoft Travel with Trading Standards officials receiving nearly 40 complaints from customers wanting refunds. The company has ceased trading with hundreds of holidaymakers and concertgoers facing disappointment and possible financial loss. Full report here. Finally Great Yarmouth and Acle firefighters raised money for a good cause when they offered to wash cars for a day. The Acle station got a surprise when two buses and a taxi from Our Bus turned up! Donations from the day went towards respite and rehabilitation centres for current and former firemen and their families.